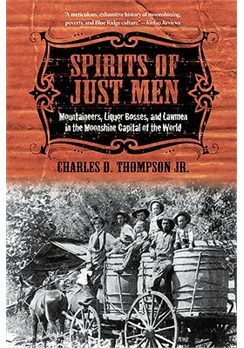 Subtitled “Mountaineers, Liquor Bosses, and Lawmen in the Moonshine Capital of the World,” Charles Thompson’s Spirits of Just Men is the second book I’ve read in the past year about the industry that made the county where I grew up (sort of) famous. The first book, Matt Bondurant’s The Wettest County in the World, is a fictional account in which the moonshine makers of Franklin County, Virginia, seem like country gangsters, the Mafia in overalls. Thompson’s nonfiction history treats such violence as an aberration. The prohibition of alcohol, together with changes in farming technology and economics, forced moonshiners to operate outside the law to feed their families. The situation was worsened when law enforcement decided to milk the situation for personal gain, accepting bribes and making their own liquor without consequences. The people who needed the income from homemade whiskey to survive (and who couldn’t afford to pay the taxes on it when prohibition laws were repealed) were having to give more and more bribe money to less-needy law enforcement officials. The seriousness of the situation became evident in a 1935 conspiracy trial in which 34 citizens were indicted for conspiracy against the federal government and 55 more were charged with aiding in the conspiracy. A few years later, some of the people involved were tried for jury tampering, and a later murder trial may have been connected. Thompson writes extensively of all three trials, but he gets beyond these dramatic events and puts the moonshine culture in context, explaining the history of the region and its people and showing how they came to be so independent and unwilling—and perhaps unable—to bend to the will of the government. His contention is that by making whiskey illegal (and later charging exorbitant taxes for it), the government took away one of the only viable sources of income for the people in the mountains of Endicott, Virginia. I wanted to understand why people—especially those I knew to be gentle and honest—got involved in whiskey making to begin with. Of course, some of the characters that emerged from my search turned out to be greedy and up to pure meanness, but many were simply trying to live. At the same time, people weren’t naive. They knew they were producing an illegal substance. That fact made them both wary of those in power and vulnerable to exploitation. Their secrecy and vulnerability in turn gave an opportunity to certain unscrupulous county leaders, including those elected to enforce the law, to create a huge liquor ring employing hundreds of men and women who produced, hauled, and sold liquor for the profit of a few. So the drink that started out as a way for poor farmers to make a few dollars to keep their farms and families solvent later turned into a racket that netted thousands of dollars for a small cadre of power brokers—at least until they were caught and brought to justice, though some say afterward as well. I grew up in a different part of the county from Endicott, the area Thompson focuses on; moonshine was made in my area, but it was perhaps was less integral to the community. Profitable crops, such as tobacco, could grow well in the area where I lived, so there were more options for the people there. My own family was, as far as I know, never involved; but from Thompson’s account, it sounds as if most of the people of Endicott made and sold at least a small amount of liquor or supplies for making it in the 1920s and 30s. Thompson suggests, however, that moonshine making was not as widespread in Franklin County as a whole as media hype of the time (and today) might have had people believe. Some people even within the county viewed the people of Endicott with suspicion. Because it’s something I heard about my whole life but never knew any details about, I found the history regarding moonshine to be interesting, but even more interesting was the regional history. Thompson goes all the way back to Scotland to trace the history of the Scotch-Irish settlers who came to Franklin County. He shows how historical events affected the small mountain community of Endicott and helps readers understand the mind-sets of the people who lived there. The Snuffy Smith stereotype of the lazy, good-for-nothing hick doesn’t hold true when you consider how hard people had to work to survive in the mountains. A few people in particular stand out in the history. Elder James Goode Hash, a preacher in the Primitive Baptist church, became a sort of local historian after his death, when his family discovered the calendars on which he recorded the events of each day. Weather reports, crop yields, and trips to Rocky Mount and Roanoke were dutifully recorded. Thompson uses Hash’s story, along with that of Episcopal missionary Ora Harrison, to explore the role of religion in the community. The chapter on Harrison’s mission, which began after she served the community as a schoolteacher and led to a mission church with school and clinic, was among my favorites. Thompson intelligently analyzes the benefits and pitfalls of such mission efforts of the time. He also briefly discusses the rise in mountain crafts as a way for people to earn a living; here, there are fascinating questions about authenticity that I would love to see further explored. As a Franklin County native, it’s hard for me to assess how widespread interest in this book might be. Much of what I enjoyed about it had to do with my connection to the area. However, I do think anyone interested in rural American history would find some of the material here to be of interest. I even found some of the arguments about government involvement in people’s lives, taxation, and farm policy echoing through to the present day. Thompson’s semi-chronological, thematic structure did make the book hard to follow at times. Each chapter focuses on a different topic, and the time lines overlap considerably. There were a few points when the time line wasn’t as clear as it could have been, and I wasn’t always sure which events took place during prohibition and which didn’t. Plus, the book is occasionally repetitive, which might help people who tend to dip into their nonfiction a chapter at a time, but which was less useful for someone like me, who tends to read straight through. Overall, however, this is a solid, readable work of nonfiction that takes a little-known bit of history and shows how it connects with the larger story we learn from history textbooks. It’s a story about the people we only see lurking in the shadows of our history lessons, and I’m glad to have found it. This is a pertinent topic for our times, too. I’ve heard that one of the largest declines in drinking in America actually took place shortly after prohibition was repealed. Turned out is was much harder for many people to get liquor once it became legal to drink it. It’s pertinent in a lot of ways. The independence and suspicion of government among rural folks, which Thompson gets at the roots of, are huge elements in politics today. I’d never heard that about drinking declines after prohibition–that’s pretty interesting. I can imagine that the price would go up once it could be taxed and more middlemen could get involved, and then those who didn’t pay the taxes went underground and paid a whole other set of middlemen, so the illegal stuff became harder to get and probably more expensive. I remember being interested in your review of the earlier book, but this one sounds better, so I’m glad you’ve reviewed it. My boyfriend spent a large part of his childhood in nearby Rockbridge County, and though his family isn’t from there originally he does have an interest in the region’s history (which he has also passed on to me). We’re both also pretty interested in the topic of this sort of illicit economic activity. This is a much better book. 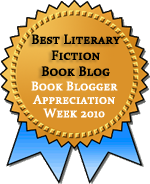 Bondurant’s book was sort of clumsy and mostly speculative. Thompson did a lot of research, talking to people involved and reading documents (including that amazing calendar from Elder Hash). And the discussion of the whole underground economy involved was fascinating. Rockbridge County is beautiful country. Natural Bridge was a regular Sunday outing for my family when I was growing up, and my parents and siblings still have family camp-outs there a few times a year. This book is so up my alley. I bought one at the Texas Book Festival last year called Tales of Bad Men, Bad Women, and Bad Places. It was about the area where I lived and sounds similar to this in a lot of ways. Thanks for the heads up on this one. I love reading these kinds of stories, about people whom you never hear about in history books, and it is especially exciting when you know the area already. When I was in junior high school (the early 1970s), we would have law enforcement come and speak to us about moonshine (for many years, I kept a ruler they gave everyone–with MOONSHINE KILLS on it). I suppose it was similar to those D.A.R.E. programs they have in schools today. At the time I was baffled by it, but many of the students at our coastal Georgia school lived in very rural areas further inland and many of them had parents and grandparents who still had stills in the backyard. We used to have similar presentations about moonshine in the mid-1980s. What I find interesting, looking back on it, is that moonshine itself is not necessarily dangerous, if it’s manufactured correctly (Thompson explains a bit about how it can be dangerous), but those presentations gave the impression that it was illegal solely because of the danger, not because of the tax implications. I think the Okrent book is already on my list, and I’ll definitely keep an eye out for the PBS documentary. I did not know you were a Franklin Co native! I went to college in SWVA, and it is my adopted or second home still. I had many friends from the area. In fact, one of my Franklin Co classmates still had family involved in the trade in the late 90s. He would bring some back to our dry campus with great regularity. If you’re at all interested in the topic, it is. It sounds like a fascinating read to me. I was brought up in a Scottish whiskey distillery town but as far as I know nobody ever thought of making moonshine, I think it was easier to steal the real thing! The whole idea of prohibition seems crazy to me but I suppose the drug situation is similar now. If they legalised and taxed drugs it might solve a big problem. Some Polish migrant workers blew themselves up whilst trying to make vodka a couple of weeks ago, I think it was in England. Five of them died.